Secure remote access to your computer from any computer. Is there a better alternative to NTRconnect Remote Access? Is NTRconnect Remote Access really the best app in Network category? Will NTRconnect Remote Access work good on macOS 10.13.4? Mobile remote access and improved desktop sharing. NTRconnect Remote Access needs a rating. Be the first to rate this app and get the discussion started! NTRconnect Remote Access... Secure remote access to your computer from any computer at any time. NTRconnect Free offers easy access free of charge to all your applications, files, folders and email for up to two computers. NTRconnect Pro includes all the features of NTRconnect Free plus file transfer, advanced keycard security, Wake-on-LAN, invite a guest capability and keyboard, mouse and screen blocking. All NTRconnect products use 256bit AES end-to-end encryption to ensure the safety and privacy of your remote sessions. You can further enhance security by using key cards, authenticated user sessions and a wide range of features designed to guarantee corporate-level security. Use either NTRconnect Free or NTRconnect Pro to work from any location or to access your computer resources while traveling. Keep in touch, answer e-mails, respond to your customers and colleagues at any time no matter where you are. No more driving in to the office just to check emails or get a needed file. Access your intranet whenever you need to. You can access your corporate intranet as if you were working right in front of your office PC. How does it work? First, access the NTRconnect and enter your username and password. Second, select the computer you wish to control (you can select any of the computers you have access to from the Control Panel). 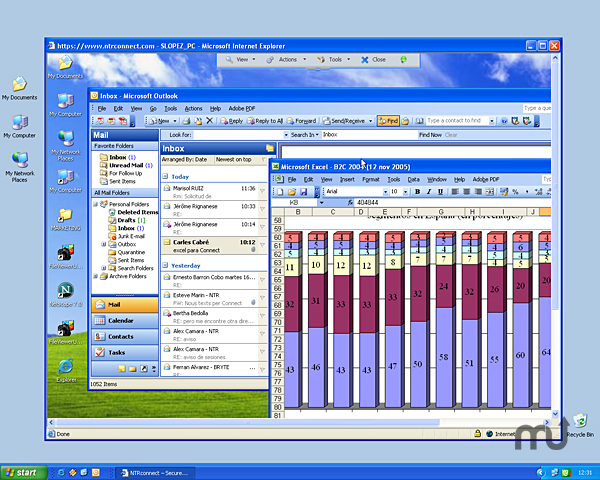 Third, access the remote computer selected; the desktop of the remote computer will appear in a new window. From there, you can access all your files and programs. NTRconnect works with Skype. Share your desktop with your contacts by sending them a link via a Skype message. Download a free trial version of NTRconnect today and see how easy it can be to remotely access your PC or Mac.